Step-1. 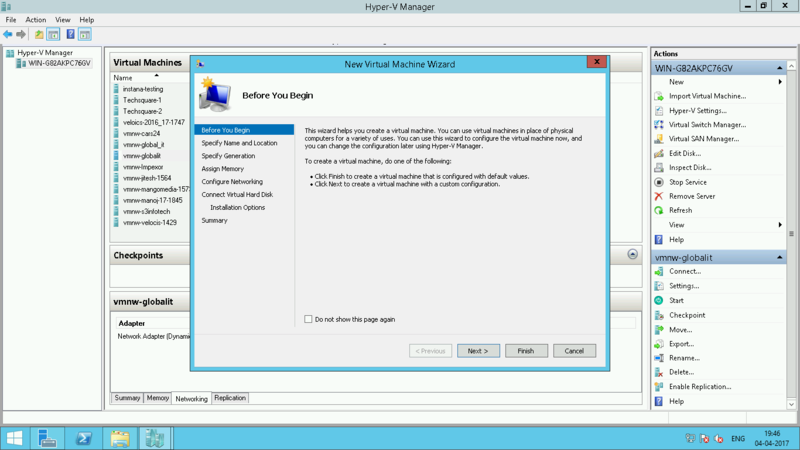 Login to the Hyper-V and open Hyper-V Manager. Step-2. 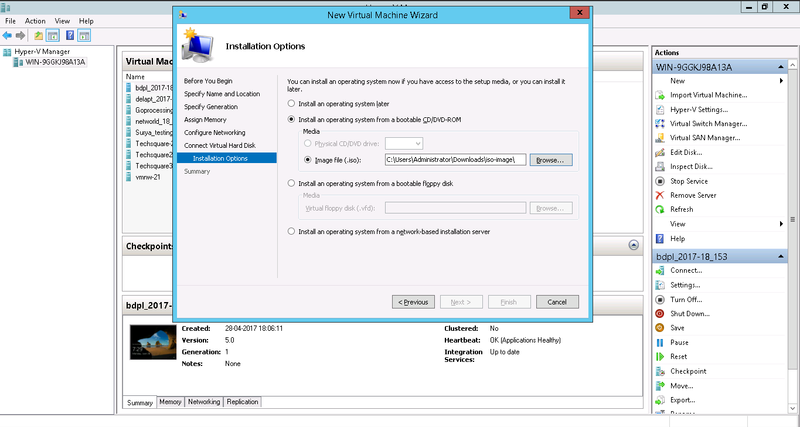 From the Actions panel on the top right corner, click New -> Virtual Machine. Step-3. 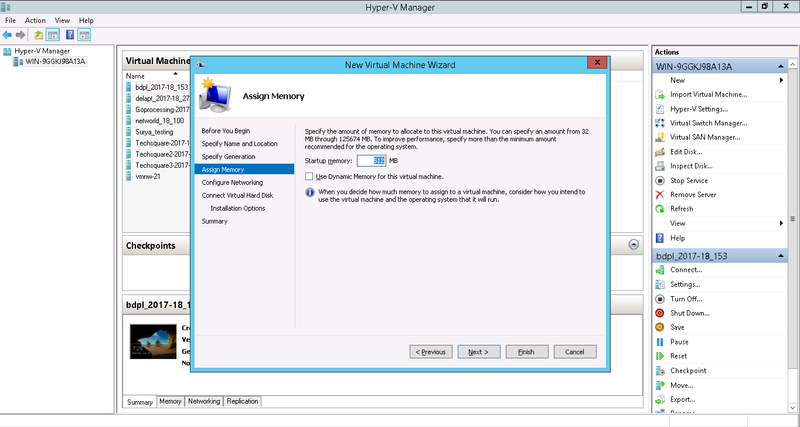 Click Next in the New Virtual Machine wizard. Step-4. On the Specify Name and Location page, Enter the VCN name along with the Estimate Number as below and click on Next. Step-6. 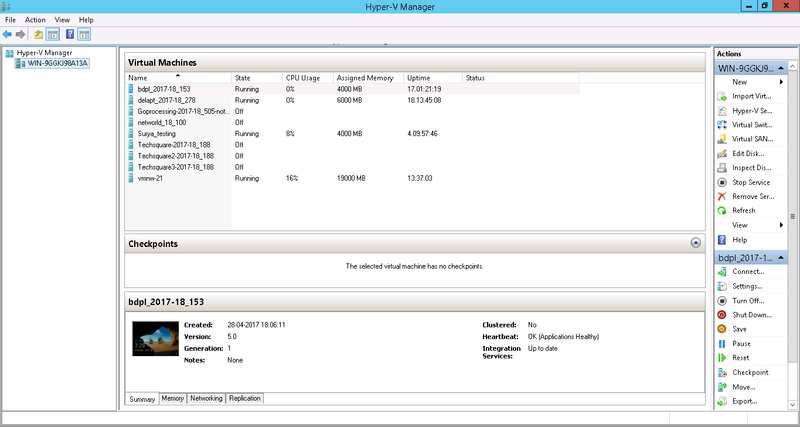 On Assign Memory page, Enter appropriate startup memory (RAM) for the Server and click on Next. Step-7. 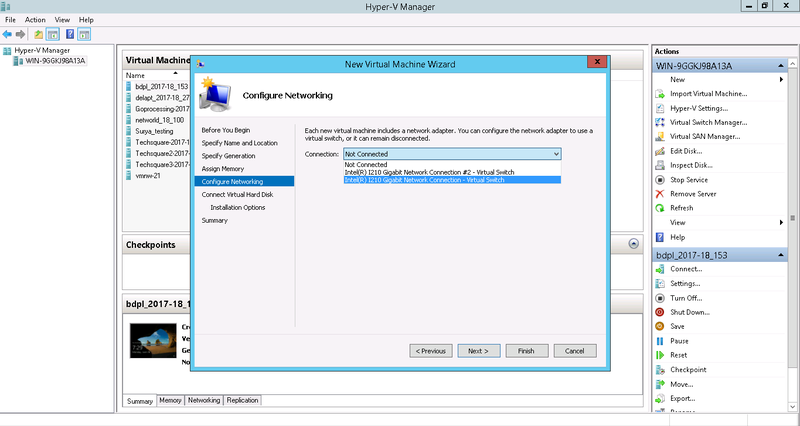 On Configure Networking page, Select the required Virtual switch for the server and click on Next. Step-8. 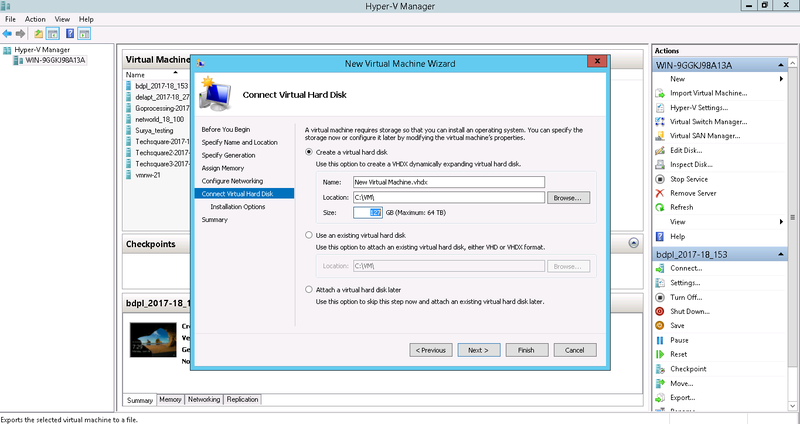 On the Connect Virtual Hard Disk page, specify the disk space according to the plan the customer has opted for. Step-9. On the Installation Options page, choose the option Install an operating system from a bootable CD/DVD-ROM and click on option Image file (.iso:)and browse for the required OS from the ISO file (if present). Step-10. On the Summary page, verify your selections and then click on Finish. Step-1. 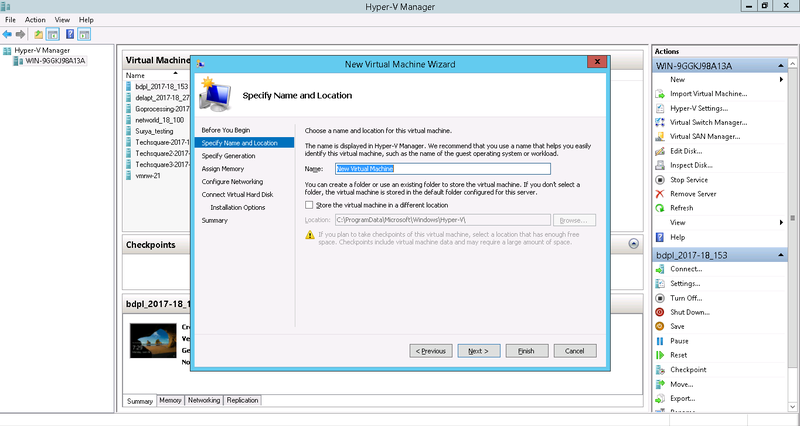 From Hyper-V Manager, in the Virtual Machines section of the results pane, right-click the name of the virtual machine and click Connect. Step-2. 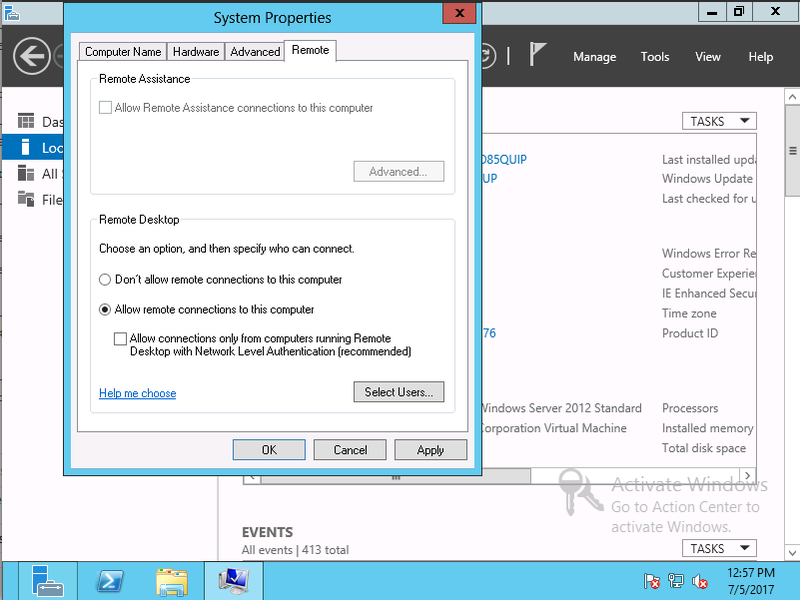 From the Action menu in the Virtual Machine Connection window, click Start. Step-3. Proceed through the installation. Step-4. Click Install Now to begin the installation. Step-5. You receive the options shown in below figure, Select the required option and then click Next. Step-6. You are asked to accept the License terms and Agreement. Select the check box labeled I accept the License terms and Agreement and then click Next. Step-7. 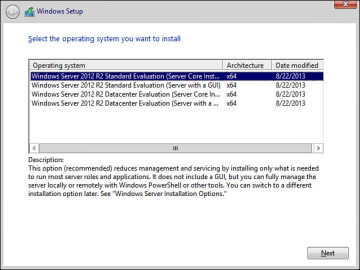 You receive the options upgrade or install a clean copy of Windows Server. 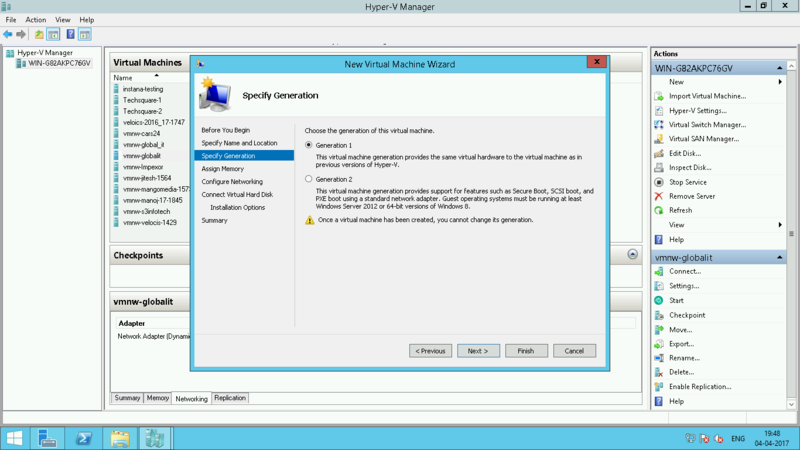 Select Custom (advanced) Install Windows only (advanced). Step-8. 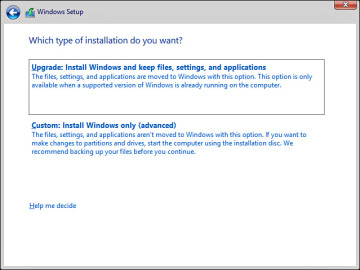 Select the disk on which you want to install Windows and then click Next. Step-9. Take a coffee break while the installation proceeds. 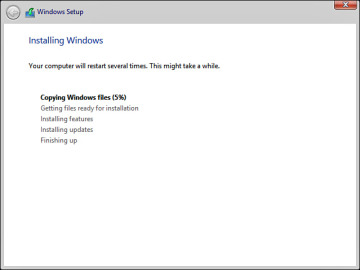 This takes some time (particularly when installing on a virtual machine), and the computer restarts several times. Step-2. 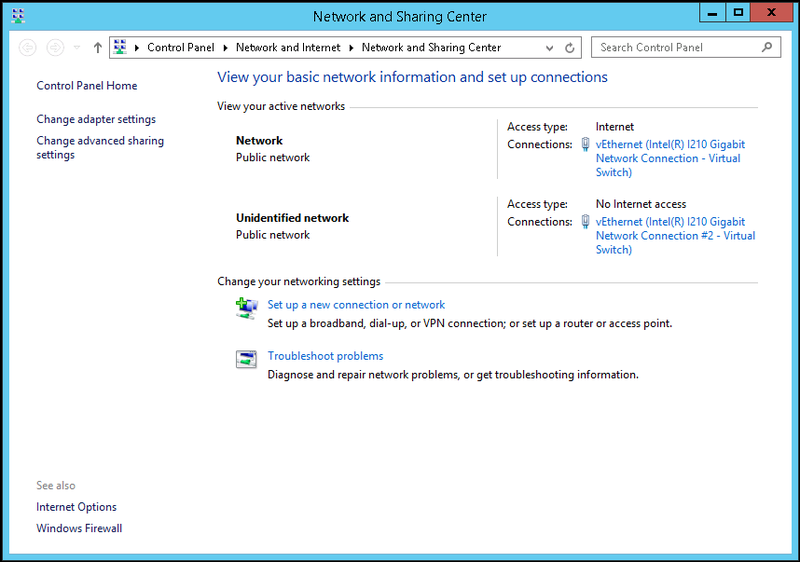 Open Network and Sharing Center and click on Change adapter settings. Step-3. Right click on the appropriate connection -> Select Properties. Step-4. 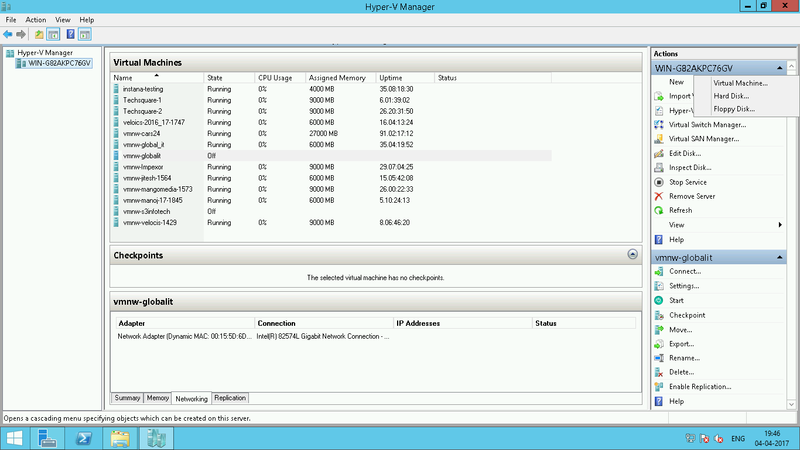 Disable IPV6 by unchecking the IPV6 box. Step-5. 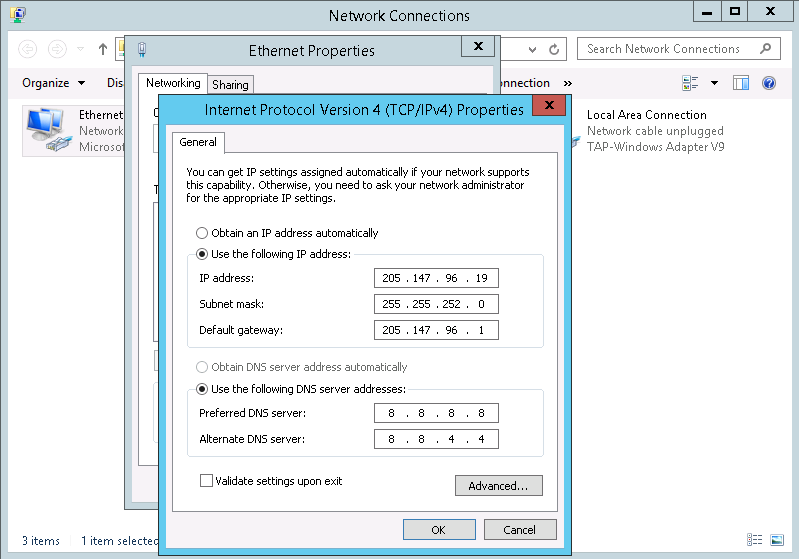 Select IPv4 and Click on Properties, Click on Use the following IP address and enter the IP address which is provided by the Provisioning team. Step-6. Enter the Google Name server in DNS details boxes. Step-7. Save the settings and Exit. Step-2. 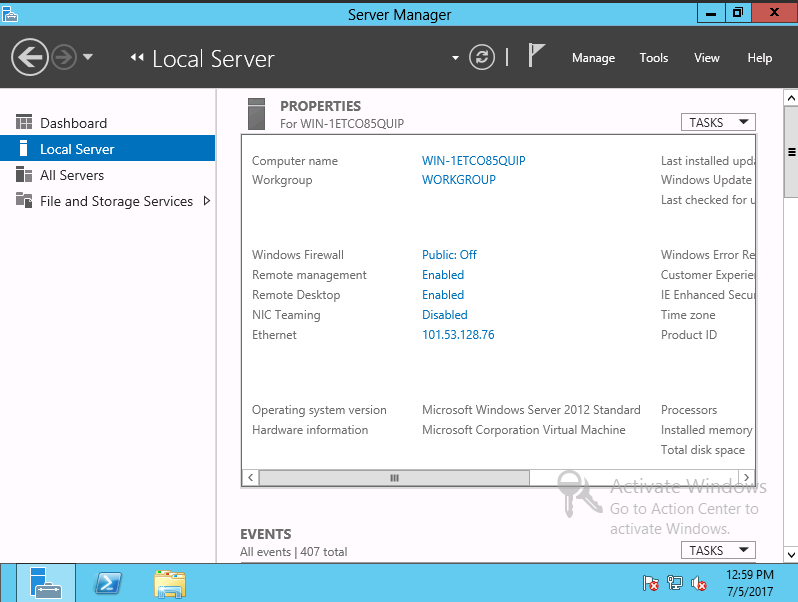 Select Local server and Click on Remote Desktop option. Step-4. 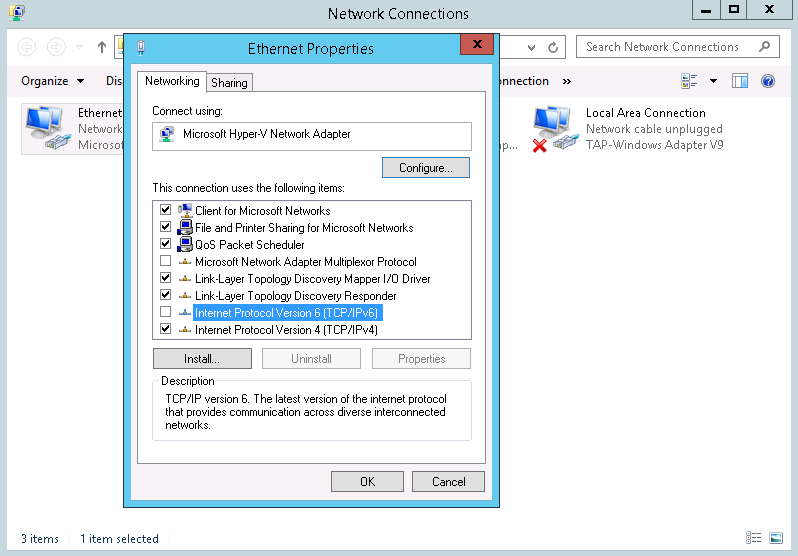 Review the information in the Remote Desktop dialog box, and then click OK twice. 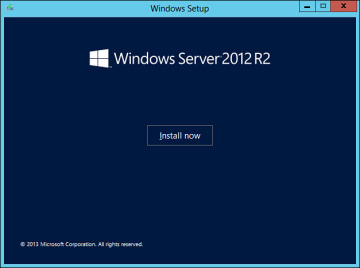 Incase, if we are unable to rdesktop the server after launching VM. 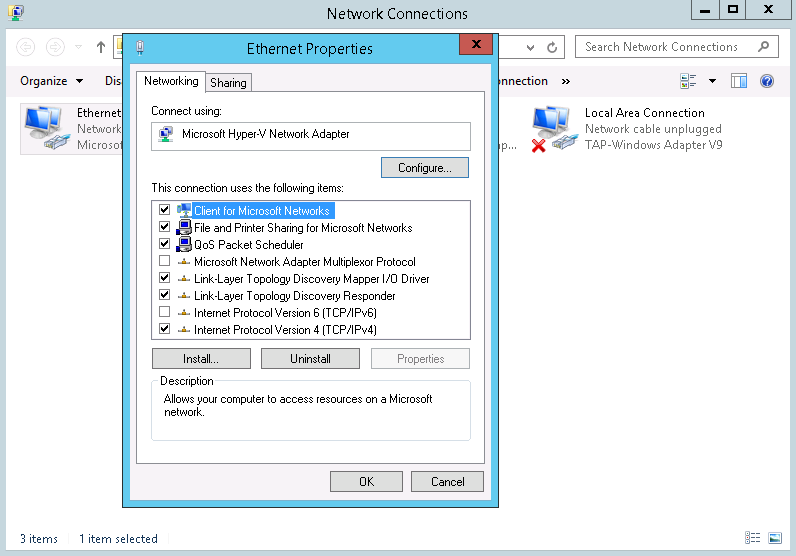 Please enable the rule "Remote Desktop - User Mode (UDP-In)"